1. Drink More Sparkling Wine: As the recent WBW #28 proved, there is a lot of good, affordable sparkling wine. Sure, it's all on sale now since most sparkling wine is purchased in the US between December 1 and January 1, but a wide range of bottlings is available at attractive price points all year. 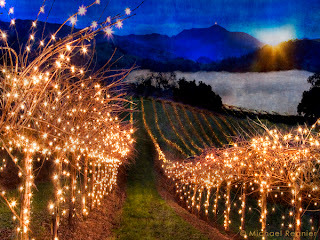 The world of sparkling wines shouldn't be about just the holidays. With all the wine preservation gadgets out there, it really isn't any more difficult to keep sparkling wine in the fridge for 2-3 days than any other wine. And, how many other wines go with food as well as champagne? It's as appropriate for a caesar salad as it is for lobster or some simple grilled chicken. I'm going to make a point of keeping some affordable sparklers on hand to pop in the fridge so that every day can be a celebration. 2. Keep Drinking Unfashionable Wine: Back when Merlot was fashionable and you could get domestic Pinot Noir for a song, I drank Pinot. Now that Pinot is fashionable and prices are sky-rocketing, I'm drinking more Syrah and Gamay. One of the best budget wine tips around is to drink unfashionable wine. Readily available wines that are for the moment unfashionable include Gamay, Petite Sirah, Chenin Blanc, Riesling, and Gewurztraminer. Fashion is fickle, so of course one of these will soon become fashionable, and then I'll turn to something else. But it's always a good idea to keep track of trends--and then drink something else! Added benefits: keeps you from falling into a rut, and enhances imaginative thinking about wine, since you are drinking what you discover you like and not what the marketing machine is telling you is "hot." 3. Get to Know Spain: Over the past year I've only bought three wines from Spain, and I gave two of them away without drinking them. That's a situation I need to rectify, since Spain produces interesting, food-friendly wines at great prices. I'm going to learn more about the varietals of this ancient wine-growing region, and drink more of them, too. I've got five bottles of red in the cellar, ready to be tasted in 2007, and will be buying some whites soon. 4. Take the Leap into Burgundy: This year a very dear friend gave me a 2003 Vincent Girardin Echezeaux. I was so awed at owning this wine, that I stuck it in the cellar to think about how best to drink it and realized I have a major case of Burgundy Anxiety. OK, the high prices on Burgundy on the west coast of the US (lots of shipping miles for a fragile wine) don't help. I drink lots of Beaujolais, which is technically from Burgundy, so this is clearly something I could get over if I put my mind to it. I am now the proud owner of 4 bottles of wine from Burgundy: the afore-mentioned 2003 Echezeaux; a 2005 Domaine Raymond Dupont-Fahn Auxey-Duresses; a 2002 La Chablisienne Chablis; and a sparkling rose cremant de bourgogne. This year I am determined to do a little more reading, buying, and tasting to learn about the wine. I will probably not become a regular drinker of Burgundy wines any time soon, given their scarcity and cost, but I would like not to break out into a rash at the mere thought of them. What are your wine resolutions for 2007? What old habits are you going to try to break, and what new ones are you going to replace them with? This beautiful label by artist Colleen Teitgen serves as the first hint of the beautiful wine inside made by her husband, Erick Kent. The 2003 Eric Kent Wine Cellars Sonoma Coast Chardonnay is so beautiful inside and out that I've thrown my usual "availability" criteria out the window on this one, folks. Eric Kent only made 9 barrels of this wine--just 225 cases. It's the smallest production wine I think I've had, and you probably won't find a bottle since even the winery is sold out. I nabbed one at Chronicle Wine Cellar for the unbelievably good price of $19.95 (this wine normally retails for around $27) It is an amazing chardonnay, and represents excellent QPR. If you are in Pasadena, and can beat me back there to see if there are any left, you may be able to nab one, too. Eric Kent's 2003 Sonoma Coast Chardonnay is a classic cool-climate chardonnay with grapes sourced from Russian River and Sebastapol vineyards. 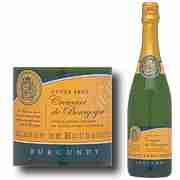 It's rich straw color is a preamble to the golden aromas of ripe pear and honey. These lead to flavors of pear, vanilla, and a touch of lemon. The wine spent 15 months in French oak barrels (60% new), but the oak is so well integrated that you get the richness without any oakey flavor. Instead, you are aware of a heavenly honey-vanilla persistence from the aromas through the finish. This is a huge chardonnay (15.5% alc/vol), but the alcohol is somehow kept in balance with the wine's impressive varietal structure. With this nearly perfect chardonnay we had some perfectly matched food: seared scallops with tarragon mashed potatoes and tarragon beurre blanc sauce. Like the wine, this meal was both fresh and rich, which resulted in a nice partnership of flavors and textures. Getting your hands on a bottle of Erick Kent wines in the future is going to be tough, since the entire output of the winery is miniscule and the UK's Decanter magazine named the winery "one to watch" in October of 2006. There is a pre-release club that I am extremely tempted to join (5 bottles a year at 30% discount) and the website has a good list of all the stores in the US that carry their wines. If one is near you, I'd suggest you hot-foot it over there and put your name down now for the next bottle that comes in the door. Yes, it's that good. The 2003 Ferrari-Carano Siena ($16.69, Costco) is a red blend made up of Sangiovese, Malbec, and Cabernet Sauvignon with a touch of Petit Verdot. As I said in an earlier post, I prefer red blends that have a rhyme or a reason to them, and I cannot for the life of me figure this one out. The Ferrari-Carano website explains that to reflect their Italian heritage they blended Sangiovese with "Sonoma County's finest grapes." OK, but why? And why blend Sangiovese (plummy) with Malbec (more plummy)? A huge fan of their Fume Blanc wine, which is one of the great values in California Sauvignon Blanc, and their Syrah, I decided to give this red blend a try. Despite my reservations, when I popped the cork and poured this wine into the glass it had a beautiful darkly reddish purple color to it. Sniffing the wine, I could detect aromas of black licorice candy and plums along with a slightly hot, alcoholic note. Drinking the wine brought out pronounced plummy flavors, with notes of cinnamon. This sweet and spicy wine has good QPR, with the plummy flavors characteristic of Sangiovese and Malbec (along with the Sangiovese cinnamon), but it is a bit pricey for a rustic red blend. I'm not sorry I had it, but I'm not sure I'd seek out another bottle, either. We had the Siena wine with a traditional Italian dish done up the Jamie Oliver way: pollo alla cacciatora (aka Chicken Cacciatore). After pouring all of our remaining 2004 Big House Red over the chicken for a long slow marinade (the chicken is cooked in the marinade later), and combining a flavorful blend of tomatoes, anchovies, bay leaves, and olives it was popped into a low oven for 1 1/2 hours. It was rich, earthy, and pungent with all those anchovies and olives. This robust, saline fare was a perfect foil for the plummy sweetness of the Siena. Phew! 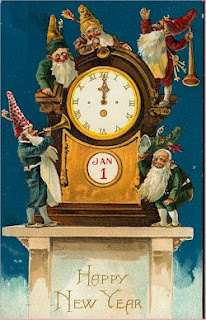 We're in the week break between the end of Hanukkah and Christmas and the New Year's festivities. If you are stumped for ideas on how to while away the hours with family and friends on the Eve (waiting for the ball to fall) or the Day (football anyone?) why not consider a little wine tasting? 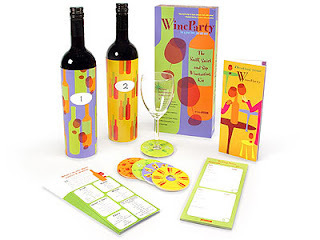 You can always buy a wine party kit, like this one on offer from the Napa General Store. Or, armed with a color printer and some ingenuity, you can put together your own wine tasting kit using the internet. I was stunned to discover how many online resources there are for people interested in hosting such an event. Everything from placemats to tasting note sheets and flavor maps are there for free downloading thanks to the generosity of wine bloggers and wine writers with more traditional websites. Wine Parties demand a little bit of forethought and planning, but nothing too stressful. Here's an outline of what you will need to sort out in advance. First you have to decide on a few details. The most important is whether you are going to do a blind tasting with brown paper bags, or a regular tasting. I would recommend the blind tasting only if you set a single varietal or type of wine as a theme (like merlots, Oregon Pinots, or sparklers) or if you are all impressively geeky and knowledgeable and want to guess the varietals. If you have relative wine newbies, this can be extremely intimidating and Not Fun At All, so don't go with "guess the wine" unless you know this will be enjoyable to all concerned. In a regular tasting, the bottles are lined up on the table without bags, and you know what you're tasting when you taste it. This is your best bet if everyone is bringing different varietals and types of wine, and/0r you've got some relatively inexperienced tasters and want to make this fun. Irrespective of what kind of wine tasting you want to have, you should set a price limit or price range to help guide your guests in the wine store. I would go for under $15, but with some wine types or themes you may have to go higher. As for number of guests, 8-12 is usually an ideal number for a wine tasting, but you can certainly still have a good time with fewer or more people. If you are going to have more than 20, you should have 2 tables set up and divide the bottles between the tables. To send invitations, I always use Evite, the online invitation service that sends out invitations, reminders, and lets you track rsvps. The basic service is free, and for a winter wine tasting I particularly liked this invitation. Less seasonal options include this wine and cheese invite, a surrealistic wine invite, a luridly purple invite with wine glasses, and one with a photographed glass of white wine. (You can always design your own using one of your favorite photos if none of these suit.) Make sure you tell people what to bring in the message section, i.e. "any wine under $20," "Italian reds under $15," or "California Cabs." Yes, it is certainly impressive to have six glasses set out on the tables for each and every guest, but how many of us have 60 glasses? More important, who wants to wash them afterwards? Instead, I'd go with 3 glasses per person (one white, one red, one sparkling) and instruct people to rinse between pours. Remember to put buckets and pitchers of water on the table for this purpose. Alternatively, just put 1 glass at each setting, and rinse more often. If you really want to go nuts on glasses, head over to a wine chain store near you and see if they have any boxed wine glass sets laying around. I picked up 2 boxes last year, each neatly holding 24 glasses. Here's where the internet is REALLY your friend. First, you need a flavor and aroma guide for each person. You can spring for the original wine aroma wheel, or download Alder Yarrow's Vinography Aroma Card and print it out on a color printer. Trust me: do not skip this step. It takes so much of the mystery out of wine tasting, and even wine drinkers who start saying "I smell wine," end up saying "Hey, I smell cherries!" with a little help from these cards. Second, you need tasting sheets. OpenBottles combines flavor/aroma hints with a tasting sheet in one handy page for up to 3 wines. De Long Wine Moment's 3-wine tasting sheet uses icons and checkboxes, but leaves the description of flavors and aromas to you. This sheet is my personal favorite, since it is good for newbies and more advanced tasters. If you are doing a blind tasting of one varietal, Wine Country Getaways has a specially designed tasting sheet just for that purpose. A third optional step is to print out flight sheets: placemats with circles for the wine glasses. This is the thing to do if you are going to put out multiple glasses of wine. The Frugal Oenophile has downloadable flight sheets for either 6-glass flights or 8-glass flights. Just before the party, set out your wine glasses, aroma wheels/cards, tasting sheets, pens/pencils, jugs of water, water glasses, rinsing/spitting buckets, and baskets of bread or crackers. You need to arrange these on the table as if you are having a dinner--not buffet style--with everything within arm's reach for each guest. This might require multiple water jugs and buckets, so check your cupboards for tupperware and pitchers in advance. Take the wine off people's hands when they arrive. If it is a blind tasting, whisk them into the kitchen and remove the foil which also has identifying logos on it before putting the bottle into a plain wine bag that you've saved from a trip to the supermarket. If it isn't a blind tasting, start figuring out the order or wines. Classic wisdom is to go from lightest to heaviest whites, then the lightest to heaviest reds. How do you do that? Check the alcohol levels in the tiny type. It's up to you if there is a sparkler whether to start or end with it. If there is a dessert wine or port, always end with that. Jack and Joanne at Fork & Bottle are the hosts for the January edition of Wine Blogging Wednesday. The theme for this month's event is Biodynamic wines, and you can click on the theme for a full brief. On January 17, winebloggers will post their tasting notes for wines produced following this method. I've written before on biodynamics, and in that post I reviewed a 2004 Sollner Danubio Gruner Veltliner and provided links to stories about biodynamic farming methods (including a link to an NPR story). Biodynamics uses traditional farming practices gathered together by the theosophist Rudolf Steiner, and an increasing number of winemakers are being drawn to the methods for reasons of sustainability and because some feel that the methods increase terroir in the wines. I was first introduced to biodynamic farming at Oz Farm in Point Arena, CA where I tasted a fabulous 2002 Porter-Bass Zinfandel that was made biodynamically. You can check out my tasting note on Cellar-Tracker by clicking here. It may sound like hooey, but I think there's something to it--or at least that's what my tastebuds tell me. And I approve of anything that is easier on the land and uses less chemical intervention. If you want to find a biodynamic wine and participate in the event, or even just drink along in the comfort of your own home, it may take you longer than usual to find one of these wines. Many are produced in relatively small quantities. Jack and Joanne have provided an excellent list of vineyards who use biodynamic farming methods, so happy hunting and I'll see you back here in mid-January! Wishing you and yours happy holidays and best wishes for a peaceful and healthy New Year. And a big thanks to all who contributed to the Menu for Hope III. Together, wine and food bloggers and their readers donated $58,256.70 towards this worthy project. Raffle winners will be announced on 15 January 2007. Being as how it's the holidays, and absolutely GORGEOUS here in LA, we headed out to Malibu for brunch at Marmalade Cafe, home of huge portions and fast service. They're tucked into a little shopping center with a wine shop (surprise! ), so after we had our nosh I headed into Malibu Village Wines for a look around. Malibu Village Wines is a small, independent wine store with wine packed floor to ceiling. What an interesting, thoughtful selection of wines they have, all clearly pulled together by real wine lovers. A wide range of Santa Barbara and local wines is complemented by truly eclectic finds from all over the world. Their Australian and Italian selections were particularly impressive, with multiple offerings from Kilikanoon and Thorne-Clarke. 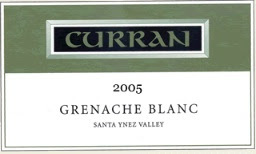 My favorite find courtesy of their friendly staff's savvy wine-scouting was a 2005 Curran Grenache Blanc from the Santa Ynez Valley ($25.50). Kris Curran (of Sea Smoke Pinot fame) now has her own label, and this is one of her offerings. I've never had a Grenache Blanc, but I am looking forward to the experience! Other finds were a 2004 Snoqualmie Naked Gewurztraminer ($12.50) made from organic grapes and a 2006 Fetish Wines Moscato Field of Dreams ($16.00) from the Barossa Valley in Australia. Their prices are very reasonable, especially given the chi-chi surrounds, and they offer mixed case discounts to their customers. For those of you outside LA: Malibu Village Wines doesn't retail over the internet, since they prefer to specialize in serving their local customers. But for those of us who live here--or are visiting this beautiful part of the world--take a moment to smell the fresh air coming off the Pacific and head out to Malibu. A Textbook Cabernet: the 2002 Peter Lehmann Barossa"
I've been pretty remiss in my coverage of cabernet sauvignon, one of the world's greatest red grape varietals. A fascinating post by Fred Koeppel on his relatively new blog, Bigger than Your Head, wonders if cabernet sauvignon truly is the king of grapes, the "stake in the ground" that shapes what we think red wine should be. That was my inspiration to pull out this wine and a flank steak from the deep-freeze and remind myself what the grape is all about. One of the reasons that I don't drink much cabernet is that it is not the most versatile wine when it comes to pairing with food--though I would be grateful for any suggestions apart from "grilled red meat" that people feel goes well with the varietal. We don't eat as much red meat--grilled or otherwise--as we used to, and so cabernets have become relative rarities in my wine storage and on my table. The food pairing problems stem in part from cabernet's varietal characteristics. Typically, cabernets exhibit flavors of green pepper, bay leaf, and currant. With processing, they can take on notes of vanilla, oak, and smoke. With bottle age they acquire flavors of earth, leather, and cedar. These flavors are often big and overpowering, and are the preamble to a dry, even astringent tannic finish. Cabernets are wines that are well-suited to years of cellaring to soften, integrate, and mellow out the flavors. Heavily oaked cabs, or those grown in warm weather regions, can sometimes be jammy and extracted, thereby loosing most of the vegetal greenness typical of the grape. The 2002 Peter Lehmann Barossa Cabernet Sauvignon is a textbook cabernet with very good QPR. It cost me $15.99 in a small independent grocery store, and a quick look at Wine-Searcher revealed that there are bottles for sale all over the US for between $13 and $18. The 2002 growing season in the Barossa Valley was very cool, which makes this cabernet sauvignon much more typical of an old world wine in flavors (though it is still a substantial 14.5% alc/vol). True garnet in color, when first opened it had pronounced aromas of green pepper. After 20 minutes in the glass, currants and bay leaf aromas developed. These aromas were echoed in the flavors, along with a touch of tar (from 12 months in French and American oak) and cedar (from bottle age). This wine has all the classic varietal characteristics of a cool-weather cabernet. I find it interesting that my fellow wine lovers over on Cellar Tracker! find this wine "thin" and a bit green--perhaps because they are used to the fruitier flavor profile of a Napa cabernet. The 2002 Peter Lehmann "The Barossa" is not huge, it's not over the top, and it's still probably a bit young. If you buy a bottle or have one in your wine rack already, I'd keep it in a cool place for another 2-3 years. I suspect with some more bottle age the cedar notes would develop and be in better balance, and this wine would be excellent. If you want to drink it now, remember that it will be at its best with food: grilled meat like lamb, sausages, or beef accompanied by simple sides (we had it with baked sweet potatoes with cracked pepper and sea salt and some steamed haricots verts). The Menu for Hope is a charity event sponsored by wine and food bloggers that selects a worthy cause every year to receive 100% of the proceeds from a virtual raffle on the internet. As of this posting, generous bloggers and readers have already donated over $40,000.00 to the cause, and there is still one day left to make a contribution. All over the web food and wine bloggers have donated fabulous prizes that are waiting for YOU. What do you need to do? Simply buy a raffle ticket for $10, pick the prize drawing you'd like to enter, and wait until January 15, 2oo7 when the winners will be announced. Can't decide between all these fabulous prizes on offer? Buy several raffle tickets, and try your chances on all your favorites. And if you really, really want one prize? Then buy lots of tickets, and devote them all to getting your heart's desire. All the proceeds from a Menu for Hope III will go this year to the UN World Food Programme. What better fund to benefit from contributions from food and wine bloggers and readers. The campaign is essentially a big raffle for prizes. You look through the prizes, figure out which one(s) you want to try to win, and then you buy "virtual raffle tickets" -- one for each $10 of donation you make to our cause on the special web site set up for that purpose. When you make your donation, you simply specify the prize number(s) (each prize should have one) and the "number of tickets" your donation is buying. Donate thirty bucks, get three tickets, and use them for one prize, or for three. Just be specific in your request. Here's the site to enter / donate. Looking for the list of prizes? Check out Alder's full list or prizes, and his list of updates donated by wine bloggers. Want to have dinner with Eric Asimov, wine critic for the New York Times? How about having Alder Yarrow serve as your sommelier for the night at a dinner party you host--and he'll even supply the wine? How about one of Jerry Hall's fabulous wine bottle photos, blown up into poster size to hang over your wine rack? All these great prizes and more could be yours for just $10 a ticket. It's the season for giving, and for remembering those less fortunate than ourselves. Click over and contribute to this worthy, worthy cause. Do you know which nation consumes more sparkling wine per capita than any other? No, it's Germany. I learned this fun fact from Golly over at Golly's Wine Drops, where he reviewed a different German sparker for you to check out when you're done reading this. Every LA area Trader Joe's that I've been to in December has end-caps full of this German sparkler: the NV Schloss Biebrich Sekt ($3.99, Trader Joe's). While I tend not to find their $5.99 wines either exciting or particularly drinkable this is the third bottle of $3.99 wine from Trader Joe's that I've really enjoyed. It represented excellent QPR, and at that price I'd buy quite a few and put them away for the rest of the winter. Bright and floral, this wine was almost as translucent and colorless as water. It had a modest apple aroma, and when the wine was poured in the glass there was an alarming amount of froth (ok, mousse for the geeks out there). Usually wines with lots of froth/mousse the bubbles are big and harsh, but the Schloss Biebrich bubbles were smooth and small. On the palate, there wasn't a harsh or bitter note, just warm pears flavors and a lingering impression of flowers on the finish. This wine is probably made with riesling grapes, but I can't find out much about it on the web, so that's just conjecture on my part. The Deutsches Weininstitut has a great article on German sekt sparklers, if you would like more information. This wine is just a hair off-dry, and would be perfect with Indian food, Thai food, Szechuan food, and light appetizers. We had a yummy Asian fusion meal with it: a spicy sauced salmon with coconut rice topped with edamame and a fresh mango salsa (note: I subbed a salmon fillet for the chicken in the original recipe). This was perfect with the wine, and it would be a fast recipe to knock together for an impressive meal for guests who might drop by during the holidays. New York Times wine critic Eric Asimov over at his excellent blog The Pour recently posted a story on the underappreciated and un-fashionable varietal chenin blanc. 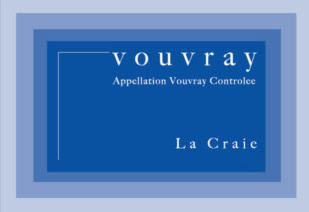 Just so Eric doesn't feel too lonely in chenin blanc heaven, I wanted to post this recommendation for a chenin blanc from Vouvray in France: the excellent QPR 2004 La Craie Vouvray (Chronicle Wine Cellar, $7.95). This is not your parents' chenin blanc. I have some pretty vivid memories of large jugs of wine labelled "chenin blanc" entering my childhood home--you know the ones with the little loopy handle at the top and the metal screw cap. (My parents would want you to know that they don't drink this anymore!) Every 40 something wine blogger out there, and most every 40 something wine enthusiast can probably recall a similar vignette from their own past. Some of us even got our start drinking the stuff. But chenin blanc is a versatile grape that seems particularly good at drawing up the influences from the soil up into its root system, spreading them out into the fruit. Because chenin blanc is typically not manipulated very much in the processing of the grapes, all those appellation nuances come through in the finished project. Take this 2004 La Craie. Named after the chalky soils on which the grapes are grown (craie is chalk in French), this pale lemon wine had enticing crisp citrus aromas. Sipping the wine brought out more citrus and green apple flavors, with a hint of a sweet impression as the last drops slid down. Despite the sweet aftertaste, this was a crisp, dry wine. But now swirl it in the glass and smell. That's right: crushed chalk, just like in your first grade classroom. Take another sip: now there is an aftertaste of crushed chalk in your mouth, too. As with all white wines, these more subtle flavors will disappear if you serve the wine too cold. The versatile chenin blanc grape produced, in this case, an equally versatile wine that would go with turkey, seafood, Chinese or Thai take-out, and salads. Expand your horizons and keep some of these grapes from falling into Eric's clutches. Better yet, buy some of this inexpensive, high quality wine and use the rest of your $20 bill to buy a chance to have dinner with Eric through the raffle for Menu for Hope III, a great event to support the UN World Food Programme. If you win, you'll have one more thing to talk about! What Are You Getting Your Favorite Oenophile? With Hanukkah in full swing and Christmas coming at the weekend, many of us are looking for last-minute gifts. It seemed like the right moment to put up a few suggestions of gifts for wine lovers that they can't drink. Most of these (like most of the wine I review) are under $20, and I've linked each to an online site that (as of yesterday) had the items in stock. Of course, you may find something similar in a local shop and save yourself the shipping costs. Then again, you can just click on over and save yourself the driving aggravation! I've broken these gifts into categories, but those shouldn't be seen as restrictive in any way--they were just a way to bring some organization into what would otherwise have been a simple list. You can check out my earlier recommendations for gifts for wine lovers by clicking here. Andrea Immer Robinson's Great Wine Made Simple: Straight Talk from a Master Sommelier, from Amazon.com ($18.95). This was the book that got me started, and though a relative oldie, it's still a goodie. Great on varietal characteristics, old/new world taste comparisons, and food-pairing advice. These may not scream romance, but they're gifts that any wine-lover will appreciate and use daily. Much better than buying them more wine glasses, or a bottle of wine they may not like. These washing-up products are available from IWA and many other retailers. The brushes are specially shaped to clean stemware and decanters, and the stemware racks help you avoid the problem of opening the dishwasher only to find that your beautiful glasses are now beautiful, stemless glasses. Both of these gifts are ideal for master entertainers. The journal has plenty of space to record menus, guestlists, seating plans, and of course wines served. (you'll have to go to the site to enlarge it--clicking on it here won't do any good!) Goldstein's book is the best I've seen at not only telling you which wine goes with which food, but also why the pairing works. Highly recommended. I don't do much decanting, but I probably should. I have a beautiful decanter I received as a gift, and one of my resolutions for 2007 is to decant my red wines more regularly. I found some nice, everyday decanters made from the prestigious Riedel firm over at The Wine Enthusiast, along with some stylish decanter stoppers. The stoppers would also be an excellent gift for klutzes like me who have broken every stopper they ever possessed. 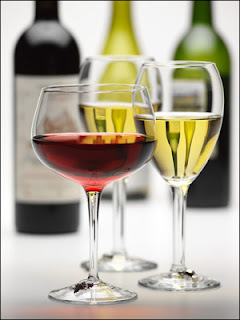 Most of us serve our white wines too cold and our reds too warm. 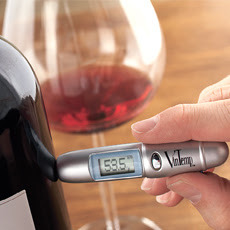 This nifty gadget (there is a pricier one with a key ring attachment, though it scares me to think of people whipping these out of their pockets at restaurants and parties), enables you to check the temperature of wine inside the bottle before you pour it. A gadget, but one that you might conceivably use! I have mountains of corks that I can't part with. They sit in bowls, roll around in drawers, and are a complete nuisance. 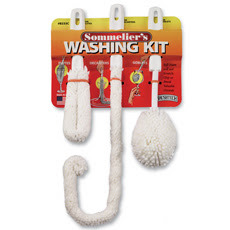 This kit provides you with all you need to turn the mess into something you can use. They also have larger format trays and bulletin boards, but I think the trivet is less overwhelming! There are lots of wine reference books out there that convey information like what to buy, what to eat with what you drink, and what to collect. These books aren't like that--they are meant for reading. Beautifully written and fascinating, they collect essays on wine experiences that will transport you into private cellars and public tastings. They are also recently released, and may not be on your favorite oenophile's shelf yet. 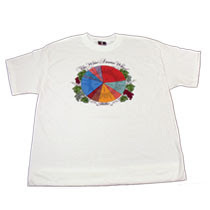 The Wine Aroma Wheel T-Shirt from the UCDavis Bookstore ($19.95) comes proudly emblazoned with Ann C. Noble's trademark aroma wheel. The aroma wheels are sold out at the moment, or they would have gone on this list, too. But here's a gift that says "I'm a wine lover." Happy shopping! And if you have any further suggestions please leave them in a comment. Never, never go wine shopping when you are feeling sorry for yourself. So I cut myself a deal: if I got some work done, I could go to Chronicle Wine Cellar and buy some wine. Chronicle Wines has lots of Italian reds, Cabernets from California, and French reds from the Rhone and Burgundy right now at wallet-friendly prices. Lots of good browsing and buying for holiday meals, and the store was full of happy customers (self included). If you need a break from all the hullabaloo, head on over there and check out their selection. Inspired by reading all those Burgundian posts coming out of Brooklyn, I was in a definite French mood. I picked up a 2005 Domaine Raymond Dupont-Fahn Auxey-Duresses ($24.95, the label for the 03 pictured here). I didn't have my vintage card with me or I probably would have also bought a bottle of 1999 Pernand Vergelesses (sorry Neil, I can't remember the maker...). Also in the box when I left were a 1998 Chateau la Grave Ste. Croix du Mont ($12.95), a wine that I've never had but it is a dessert wine from an appellation across from Sauternes; and a 2005 Domaine les Grands Bois Cotes du Rhone Cuvee Les Trois Soeurs ($9.95). I continued my romp through the European labels with a 2003 Pago Florentino Tinto from La Mancha ($14.95) and a 375ml bottle of the 2003 Bodegas Arzuaga Navarro Ribera del Duero Crianza ($12.95/375ml and $23.95/750ml). Topping it off? A 2005 Scherer Pinot Noir from Alsace ($12.95). As I sit among the bottles, with papers strewn all over my desk, the accusing blinking cursor on the computer is telling me its time to pull myself up by my bootstraps. Back to work, with the pleasant anticipation of some interesting wine to get me through the holidays and into the new year. I love red blends. I really do. Especially when there is some rhyme or reason to them. Like the great value Australian GSM wines (blends of Grenache, Syrah, and Mourvedre), where the wines are combined to soften the dustiness of the Grenache, tame the sweetness of the Syrah, and add the depth of the Mourvedre to the mix. A strange alchemy takes place in a carefully blended wine, one in which the varietal characteristics can still be discerned, but the whole is somehow greater than the sum of its parts. Then there is the 2004 Big House Red ($8.99, Trader Joe's). This wine has everything in it--including the proverbial kitchen sink thanks to the inclusion of Montepulciano grapes--and it didn't make sense to me at all. I felt that earlier vintages of this wine did have a rhyme and a reason to the varietal blend. But this one has (no joke) 8 varietals in it: Carignane, Petite Sirah, Sangiovese, Zinfandel, Barbera, Syrah, Grenache, and Montepulciano. Heh? You drink it and think, hey, that's red. That's not to say that its not a quaffable red. It is. But it lacks that interesting varietal complexity that makes a wine worth drinking. Even though it's quaffable, there are such great red blends out there even in this price bracket I couldn't help but consider it poor QPR. Readers who were fans of the widely available Bonny Doon Ca' del Sol Big House wines of the past will be interested to know that Bonny Doon sold the line to Big House Wines in late July 2006. 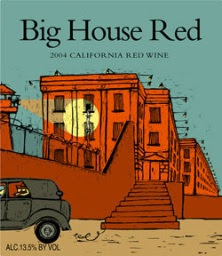 My 2004 Big House Red, though apparently made before the line was sold, lacks the Ca' del Sol designation, and there is no mention of Bonny Doon (one of the great value wine companies in my opinion) anywhere on the label. With the Big House Red we had fabulous roasted pork with savory fennel bread pudding from Cooking Light, brined for a few hours in a mixture of sugar, salt, and water. Rolled in crushed fennel seeds and minced garlic, then browned in a skillet before finishing it off it the oven, it was the best, juiciest roast pork we've ever had. The star of the meal was the bread pudding, which came out of the oven like a very soft stuffing after filling the whole house with aromas of bread, fennel, carmelized onions, and fontina cheese. This is a great meal for this hectic time of year since much of the prep can be done ahead, then it all goes in the oven for an hour, giving you lots of time to spend with guests or unwinding. And there was enough interesting flavors in the food to make a wine that tasted red a fair pairing. This experience hasn't turned me off Bonny Doon, or even the new Big House label, but I think I will do some more reading of the back labels before I purchase another one. Hopefully this line of affordable blended wines will return to its roots and the winemaker will soon concoct a blend that is enticing and engaging, rather than just over the top. The amazing Culinary Fool just posted her roundup of the more than 30 entries on sparkling wines (not champagne) that were sipped, tasted, and reviewed for this month's timely Wine Blogging Wednesday. She had so many entries that she divided her roundup into two posts. You can find the first post by clicking here, and the second post by clicking here. You will find some great recommendations for sparkling wine that is great tasting but won't put you over your holiday budget. Still not finding what you're looking for? You can read the reviews of all the sparkling wines I've had since opening shop here in October by clicking here. Cheers to Culinary Fool for her speedy work and for hosting such a great event. I'm having a difficult time concentrating on the mountain of work that I need to get done before the holidays. Looming deadlines, impending holiday festivities, and the horror of post office lines--aargh. You too? Here are some Thursday diversions to make the end of your work week just a little more enjoyable. And, they're both wine related. First, while surfing around Italian wine and food blogs (see above on procrastination) I found a link on Esalazioni Etiliche to an entertaining computer game for wine geeks courtesy of my favorite London wine merchants, Berry Bros & Rudd. Their Wine Binning Game puts you in the role of someone who has just inherited Great Uncle Algy's country house, Pickering the butler, and underground wine cellar. It tests your knowledge as you answer questions by putting wine bottles in the appropriate bins. If you succeed, you learn the secret of Uncle Algy's cellar. After the game, more procrastination can be had clicking through BB&R's superb wine information, aged Bordeaux selections, and wine-tasting dinner announcements. Not esoteric enough for your procrastination? Head over to the new wine store chain, Best Cellars (logo on the right side of the page), and take their Do You Know What You Like? quiz. Best Cellars is pioneering a new approach to wine selling, that uses flavor profiles like "Fizzy," "Fresh," "Soft," "Smooth," and "Big" to categorize their wines rather than more classic varietal or geographic sorting methods. The quiz will direct you to the Best Cellars flavor profiles that are most closely aligned to your current taste preferences. These nifty logos (right) help guide you through the stores and the online site. All of their wines have great value and are from all over the world. They also have a Beyond the Best selection of wines that represent "best values from around the world irrespective of price." While their everyday wines typically are priced under $20, the Beyond the Best selections are more expensive wines that still have excellent QPR. With stores currently in NY, DC, MA, VA, and TX here's hoping that they go nationwide soon! Happy procrastinating--then get back to work. Wine Blogging Wednesday #28: Sparklers! Just in time for the holidays, Seattle's Culinary Fool is hosting this month's Wine Blogging Wednesday. The theme she set? Sparklers (but not champagne), which are perfect for holiday quaffing and gifting. Wine Blogging Wednesday is the monthly wine blogging event started by Lenn Thompson over at Lenndevours, now in its third year and still going strong. Today wine bloggers all over the web will be popping their corks, pouring their sparklers, and picking up their pens to report their findings. In a few days the Culinary Fool will be posting a wrap-up of all the submitted posts, divided into budget sparklers good for parties, special splurges, and duds. I'll be sure to post a link to that roundup here on the site. 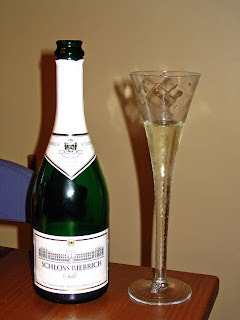 My contribution to this month's effort was to drink a sparkler from the Auxerrois region of Burgundy: the NV Blason de Bourgogne Cremant de Bourgogne Cuvee Brut (Trader Joe's, $7.99). This straw-colored sparkler had excellent QPR with its aromas of pears, apples, and the yeasty smell of lightly-browned toast. One of the things I look for in a sparkler is a relatively small bead--smooth bubbles, not too big, moving to the top of the glass in a syncopated stream--and this wine has the right stuff. When you sip this very dry, brut wine, you taste apples with a little bit of a nutty edge, and finally a tiny bit of pithy bitterness. Maybe it was the sunny label that influenced me, but I swear this tastes like Veuve Clicquot yellow label champagne. This certainly qualifies as a budget-friendly sparkling wine that you can buy in quantity for your holiday party and serve without embarrassment. It is undoubtedly the best under $10 sparkler I've had, given my taste preferences. The NV Blason de Bourgogne Cremant de Bourgogne Cuvee Brut is made by a co-op of four top-notch Burgundian growers: Cave de Buxy, Cave de Bailly, Cave La Chablisienne and Cave de Prissé. Readers from the UK will be more familiar with this wine than those in the US, since it features regularly in Tesco and Waitrose wine selections. Made with a combination of chardonnay and pinot noir grapes, you can find it in this brut blanc, and in a rose (review coming shortly). At this price, you can afford to buy both! Thanks to Culinary Fool for a great holiday theme, and see you back here for the roundup. My new favorite wine site is Appellation America. I discovered them when preparing for my trip to Santa Barbara, and since I've returned I've been able to spend some more time on their site. I noted that Tom Wark at Fermentation also mentioned them in a recent post that drew attention to the invidious and detrimental effect that meaningless wine appellations have on US wines and those of us who consume them. While regulatory bodies seem intent on assigning AVA distinctions willy-nilly, Appellation America is fighting the good and necessary fight to raise varietal and appellation consciousness in America. Why is this important? Because in good wines--wines that are made primarily in the vineyard and not drastically manipulated during processing with little tea bags full of wood chips and "all natural additives"--the site where grapes are grown effects the varietal characteristics of the wine. And knowledge of varietal characteristics is the #1 way to educate your palate. As you know, varietal characteristics and QPR are my way for evaluating wine so I take them pretty seriously. But even if you don't take them as seriously as I do, learning about varietal characteristics and how appellations shape them can add a great deal to everyone's enjoyment of wine. Up until now you needed to have a good wine reference collection to read up on varietal characteristics, and a good memory to remember them so that when you drank a pinot noir you could actually recall what one was supposed to taste like. Their fantastic site not only walks you through American appellations (AVAs) with real care, they have a wonderful guide to "varietal characters." The one pictured here is for--you guessed it--pinot noir. (reproduced with the kind permission of Appellation America) These catchy and memorable caricature-style sketches convey an awful lot about each grape. In this case, the image conveys the finicky quality of the grape, and the extent to which viticulturalists all over the world want this grape for themselves--but they find it tough going to tame this silky grape goddess. It was hard to pick just one image to include here, because all of them are vivid and engaging. So I encourage you to visit their site, and check them out for yourself. From the enthroned Campanian deity of Anglianico, to the gypsy sorceress Gewurztraminer, through the "ageing rebellious rockstar" Carignagne, and on to the masked Zorro of Zinfandel, once you've seen the pictures and read the descriptions you will be well on the way to learning your varietal characteristics! Each varietal character page includes a character sketch like the one above, a detailed description of the varietal and its history, and a comprehensive overview of every appellation in North America where the grape is grown. So if you are a fan of Leelanau Peninsula MI gewurztraminer, you can find out more about that AVA with just a click of the mouse. Please visit Appellation America and check out their resources--it's definitely worth getting to know this site and the valuable work they are doing. Tonight's wine choice started with my craving for fried chicken--but not any fried chicken. With the holidays coming up it had to be fried chicken I wouldn't hate myself for eating in 2 hours. Too many cookies lying around this time of year to be eating fried chicken! Saved by Cooking Light I put together a menu of oven-fried chicken (pretty amazing stuff dredged in a glue of egg white and buttermilk, rolled in seasoned flour, and then browned in a pan in a little oil before it's finished off in the oven), with some nifty little couscous salad cups with pomegranate dressing. (note: I fudged the dressing, since I couldn't find pomegranate molasses. I did find pomegranate vinegar at Trader Joe's and simply omitted the lemon juice, vinegar, and molasses and substituted 3 Tbs of the pomegranate vinegar). Fried chicken says chardonnay to me, but one that retains its varietal zing of tree fruits and citrus. For dinner tonight, I picked out the 2004 Chateau Ste. Michelle Chardonnay Indian Wells (Costco, $12.99), and it was a perfect choice. While this chardonnay had been processed using oak, it was very well balanced--much more so than many chardonnays at this price which can have a nasty, artificial oak and vanilla taste. This straw-colored wine had aromas of toast and apple. When you sipped it, it revealed apples, pear, and a suggestion of tropical fruit accompanied by a rich vanilla taste. There was a hazelnutty edge at the very end, just as you put your glass down to reach for another bite of chicken. Excellent QPR. Chateau Ste. Michelle deserves kudos for consistently and reliably producing wines with good varietal characteristics at a consumer-friendly price. They are my go-to label when I'm in supermarket and have to buy something since I know that their wines will combine great taste and great value. Two more annual top wine lists crossed my inbox today that I wanted to share with you. Ken Hoggins runs a website that provides wine reviews that are independent of wine-seller bias. Realizing that even budget wine buyers like me often splurge on holiday wine purchases, Ken has selected holiday wines in all price ranges for you to put on your shopping list. The wines on Ken's list were chosen with the three most popular Holiday meals in mind: ham, turkey, and prime rib. They include the2005 George Duboeuf “Fleurie - Domaine des Quatre Vents” ($16) to go with ham (I suggested an earlier vintage of this wine without the vineyard designation to go with Thanksgiving turkey, so its a versatile selection), the 2005 Chehalem Pinot Gris ($19) to go with turkey, and the pricier 2003 Paul Jaboulet Aîné “Thalabert” ($33) to serve with prime rib. He also suggests a number of more expensive bottlings that would make great gifts for wine lovers. Ken is based in Boston, and has been publishing holiday wine picks since 1999. He uses an aggregate of wine ratings from all the key magazines to help guide his choices, and uses a tasting panel to confirm or contradict those findings. Katie from AOL Food dropped me a note to let me know that their list of top wines for $5.99 or less was ready for readers. (Image from AOL's food site) Their picks include wines readily available in supermarkets and one Trader Joe label among the 5 wines. Food pairing tips are included for holiday meal planning. Catching up on my podcasts this morning, I came across a Whole Foods Top Holiday Wine Selections List. There are lots of "top" lists this time of year, but since this one is linked to a specific retail outlet, it should make for less frenzied searching and more simple purchasing. With so many Whole Foods stores not only in LA but throughout the country, I thought I would put up links to both the podcast and the article on their website. (This is my first experience linking to a podcast, so let me know if I've messed it up). As always, if you are looking for a specific bottle on their list, it saves you lots of traffic agonies if you call ahead and make sure it's actually in your local branch. There are 12 wines on the list, including a sparkling wine and what they call a "cellar selection." There are some interesting choices on there at many price points, including a tasty organic Tarantas Tempranillo-Cabernet blend. Whole Foods includes cheese pairing tips on the list, as well. Happy shopping! If you haven't heard of this book you aren't alone. I've never heard of it either, but it's won all kinds of awards. And if you are seriously interested in wine and like finding different, unusual bottlings I think there is no better book you could get yourself (or, since the holidays are coming, put on your wish list) than this little volume of research and analysis. Tom Stevenson's Wine Report (DK Publishing, $15) offers a refreshing overview of the world of wine that will shake up what you think you know about wine's big picture. The reason? This is a European publication, written by a team of about 40 writers, including many Masters of Wine. And it is a yearbook, designed to give you an overview of the past year's news and developments. 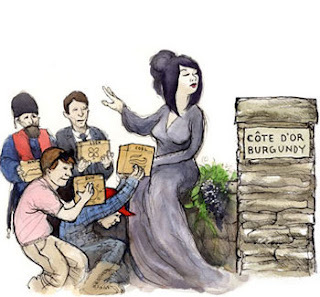 You get pieces on Burgundy by the respected writer Clive Coates, on wine and the internet by Tom Cannavan, and on California wines by Dan Berger. Besides serving as the general editor,Stevenson is particularly known for his knowledge of champagnes which he writes about in this volume. He also contributes to Tom Cannavan's Wine Pages (Stevenson's columns can be read by clicking here). The book is organized by region, with sections devoted to Bordeaux, Portugal, the Pacific Northwest and other major viticultural areas. Each region is covered in about 5 pages--the perfect length for when you're drinking your morning coffee, or sipping a glass of Alsatian wine before dinner, and need some light reading. You wouldn't want to read the book cover to cover, but if you handle it like a magazine you're on the right track. Each region has an overview, an opinion piece, vintage reports, and a series of top ten lists covering the best producers, the up-and-coming producers, rapidly improving producers, the best value producers, the greatest quality wines, the best bargains, and the most exciting wines. Some idea of the different approach you will get from this annual can be seen in Dan Berger's treament of California. Following his opinion piece on misleading labeling, we have his greatest wine producers. The top three are: Joseph Phelps, Stag's Leap--and Navarro. I think Navarro wines are the unsung heroes of California wine, but when do you see big write-ups on them? And you pretty much have to buy their wines direct from the vineyard because you aren't likely to find them in your supermarket (though they can sometimes be had at Whole Foods). Among the up-and-coming producers? Campion, Shannon Ridge, and Katherine Hall. Best value producers include Bogle, McManis, and Canyon Road. I've got wines from some of these makers in my wineracks, and will certainly keep my eye out for those I'm less familiar with. Among the greatest quality wines in Berger's piece? the 2002 Phelps Insignia ($145), Navarro's 2004 Gewurztraminer from the Anderson Valley ($14), and Dutton Goldfield's 2003 Pinot Noir from the Russian River Valley's Sanchietti Vineyard ($52). How's that for range! Best bargains include the Navarro 2004 Edelzwicker ($11), the Bonny Doon 2004 Pacific Rim Riesling ($9), and the Dry Creek 2005 Chenin Blanc ($13). And unlike any other wine guide I've seen this year, their "most exciting finds" actually sound exciting: the 2004 Chasselas Dore Berthoud ($15), the 2004 Milat Chenin Blanc ($18), and the 2001 Heitz Grignolino ($14.25). Plus, these are exciting wines you can actually afford--how refreshing! At the back of the guide the contributors had to be ruthless in selecting just a few wines from each region to include in the 100 Most Exciting Wine Finds. These are accompanied by detailed tasting notes. Like any annual guide, this one is meant to be read, acted on before the wines sell out, and then tossed to make room for next year's guide. But this one has more meat in it than most, and its take on wine--which seems to this reader to differ considerably from the wine magazines and to correspond much more closely with what you see in wine blogs--makes for interesting reading. With surprising twists and turns and hidden zingers in nearly every list, it is a wine book that I heartily recommend. Port. Like most wines, the very name evokes images and associations, whether it's champagne with its clinking glasses and popping corks, or cabernet sauvignon which immediately makes me think of steak, a house full of guests, and long conversations. For me, port conjures up leather armchairs, crackling fires, the Masterpiece Theatre theme, slippers, and pipe smoke. It is, in many ways, the quintessential winter wine, to be sipped after a hard day of holiday shopping when you're surveying the damage/loot and trying to take a moment out of the hubbub to enjoy the season. It can be hard to find good port at a reasonable price. The finest vintage ports require years of cellaring before they reach their full potential and unless you are in the habit of buying them and laying them down for later, you are paying the wine makers and merchants for the cost of storage each and every time you buy a bottle of 20- or 40-year old port. Instead, you can buy the NV Krohn Tawny Port ($11.99, Whole Foods). This excellent QPR port comes from the 19th century firm of Wiese and Krohn, which was established in Portugal by two Norwegians in 1865. Located in the Douro, Wiese and Krohn employ both traditional wine-making methods and modern technologies to produce their port. Like most makers of port, Wiese and Krohn make vintage port (made from grapes harvested in a single year to mature in the bottle), late-bottled vintage (LBV) ports (which are aged in casks for 6-7 years to accelerate the age process and then bottled) and non-vintage (NV) ports (ports made from a blend of grapes from different vintages and either aged in wood or in the bottle). Some of the finest ports in the world are the Krohn Colheita reserve ports, which earn rapturous tasting notes from appreciative drinkers. Today, the company sends 90% of its wine to Europe, with the US representing a smaller share. As if the vintage, LBV, and NV labels on ports aren't confusing enough you can buy ruby, tawny, or even white port. Ruby ports are, as the name suggests, ruby in color. They are young ports that have been aged primarily in stainless steel and in the bottle to keep them fruity and vibrant. Tawny ports are port wines that have been aged in casks. This turns their ruby color into a dark amber and makes their flavors nuttier and more oxidized. Some tawny ports, however, are simply mixtures of ruby and white ports that are aged for 4-6 years. They are half-way between ruby and traditional tawny ports in color and flavor. White ports are often served on ice, like a cocktail. Still confused? Check out Into Wine's excellent overview of this wine's history, bottling conventions, and restrictions. Though there isn't a lot of information on the NV Krohn Tawny Port on the label or on the web, as best as I can tell from looking at it and drinking it, this is a tawny port that is made from a blend of ruby and white ports, and it has seen some time (ca. 4-5 years) in casks to give it a rich, round taste. This wine is still bright ruby in color, with pronounced aromas of raisin and some spice. As you sip it (preferably in front of a crackling fire) you taste more raisins, plums, and a hint of cinnamon. I found this NV Tawny more complex than most NV ports at this price, and it didn't have the cloying sweetness of some non-vintage ruby ports. It's nothing like an old, vintage port, but it is delicious and easy to drink--and a great value for the price. Port makes an excellent dessert wine if you are serving fruit and cheese. One of my favorite desserts of all time is a slice of Huntsman Cheese, with its mixture of creamy Double Gloucester and pungent Stilton cheeses in gold and white layers like a cake, a handful of Carr's wholemeal crackers, sliced apple, and a glass of port. Even without the fire, it's the recipe for a perfect, relaxing winter's evening. We went Sideways for the final stop for our day out in the Santa Barbara wine country. After Rhone Rangering through both Bridlewood and Andrew Murray, we headed out to the Santa Rita Hills AVA and to the lovely Sanford Winery. 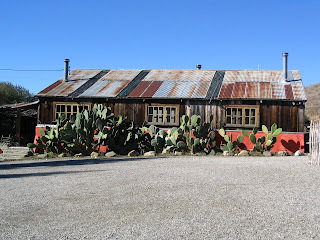 The car inched up the gravel roads between vineyards with the traces of pinot and chardonnay vines, forded a stream (no biggy--I have a 10-year-old Saturn sedan and it was just fine), and deposited us here outside the converted dairy barn with the tin roof and the prickly-pear cacti. 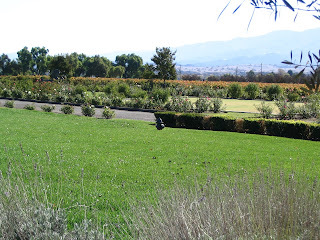 The Santa Rita Hills AVA is known for its Burgundian plantings of Pinot Noir and Chardonnay, although other varietals are now being grown there, as well. It has a strong marine influence from the nearby Pacific. and is much more westerly than the Santa Ynez Hills AVA where we began tasting wines. It is also a small appellation, with only a handful of wineries, so it is still relatively hard to find wine from this appellation in your local store. 2005 Pinot Grigio Santa Barbara County ($17): From vineyards outside Los Alamos, it was a wine with abundant nectarine and citrus aromas and flavors. Nice acidity, no bitterness, and no oak--aged in stainless steel. Very good QPR. 2005 Sauvignon Blanc California ($14): This barrel-aged sauvignon blanc, made from fruit from Sisquoc and Trubody, was round and rich with grapefruit and herbal aromas and flavors. In the fume style, this sauvignon blanc would be good with roasted chicken or seafood. Very good QPR. 2004 Chardonnay, Santa Barbara County ($17.50): Made from grapes from La Rinconada, Sanford and Benedict, and Bien Nacido vineyards. Aromas and flavors of tropical fruit, with a definite mineral undernote. Fermented in both stainless steel and oak barrels, it was a nicely balanced wine. Very Good QPR. 2005 Pinot Noir-Vin Gris, Santa Rita Hills ($14): Made from 100% Pinot Noir grapes from the La Rinconada vineyard, it underwent both tank and barrel fermentation. Peachy-berry in color, with aromas and flavors of strawberry. Dry, Tavel-style rose. Excellent QPR. 2005 Pinot Noir, Santa Rita Hills ($26): Made from grapes grown at La Rinconada and the Sanford and Benedict Vineyards, this was a bright and clear young Pinot Noir with cherry, raspberry and a lovely note of clove that is distinctive of Sanford wines that I've had. Aged in French oak (20% new) for 10 months, this wine was my favorite of the tasting. Will benefit from some cellaring, and should develop into a very interesting wine. Very good QPR. 2004 Pinot Noir, Santa Rita Hills ($26): What a difference a year can make! Made from all three of the Sanford vineyards in the Santa Rita Hills AVA, this wine was much more plummy than its younger sibling, but with the same clove note. More oak on the palate, perhaps because it was aged in French oak (30% new) for 14 months. Another year in the cellar should soften that oak a bit, and result in a round and rich Pinot Noir. Very good QPR. I knew I liked Sanford wines before I went, but I left even more impressed. Winemaker Steve Fennell and his colleagues are clearly people who love wine, and love making wine that is good to drink with family and friends over a nice meal (see their website for a special food and wine section that includes recipes developed to go especially well with Sanford wines). Sanford also has a wine club with a variety of membership levels, and this is one of the few wine clubs I would consider joining apart from Navarro Vineyards' excellent pre-release tasting program (more about that later). After we finished over at Bridlewood, we took the short trip along Rt. 154 to the charming town of Los Olivos, where there is a string of tasting rooms extending down Grand Street. (you can click on this map to enlarge the view, and you will see all the tasting rooms listed). Boutiques, galleries, restaurants, and other shops fill the streets of this small town. 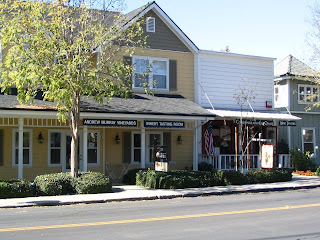 We wanted to taste some Andrew Murray wines, and since their vineyards on Zaca Station Rd. are closed to the public, our goal in Los Olivos was to stop into the tasting room pictured here. On the way we picked up sandwiches at the branch of Panino just off Grand in the heart of town. Andrew Murray is a UC Davis graduate who has received all kinds of press for his distinctive wines. He plants only Rhone varietals in his own vineyards, though he does also serve as wine maker for his neighbors at Oak Savanna. Murray is devoted to syrah in particular, and crafts his wines with the philosophy that good wines are made in the vineyard, and the winemaker "merely takes care of them" in the cellar. This is a winemaker who specializes in small production wines, and although you can sometimes find his Tous les Jours Syrah in shops, most of these wines are sold directly through the winery or in the tasting room. The Andrew Murray wines website is full of information, so I encourage you to take a look. 2005 Viognier, Santa Ynez Valley ($25): Aromatic with flowers, pineapple, and citrus, which come through as you sip the wine, too. Crisp, clean-tasting, and complex. 550 cases made. Good QPR. 2004 Enchante ($22): A blend of two white Rhone varietals (Roussanne and Marsanne). Rich tasting with melon and oak aromas and flavors. More full-bodied than the Viognier, and a nice change from chardonnay for lovers of that varietal. 800 cases produced. Good QPR. 2004 Oak Savanna Vineyards Chardonnay Rancho La Zaca ($30): An exceptional chardonnay, with pronounced pear aromas and flavors with a bit of citrus and a real streak of minerals. Bright acidity is kept in check with a little bit of oak. Round, complex, delicious. 350 cases produced. Very good QPR. 2004 Esperance ($22): Murray's red blend intended to translate Chateauneuf du Pape to the soils of Santa Ynez. Grenache, Syrah, and Mourvedre are blended into a wine with black cherry, blueberry, cinnamon, and black pepper aromas and flavors. Delicious, and will be more delicious in a few years. 850 cases produced. Good QPR. 2004 Grenache Central Coast ($28): Murray only bottles his Grenache by itself if the vintage is of sufficient quality, and the 2004 lived up to his standards. Raspberry, cranberry, and currant aromas and flavors. Unusually soft and drinkable for a 100% grenache wine, only 300 cases were produced. Good QPR. 2004 Syrah Estate Santa Ynez Valley ($25): Made only with Syrah grown on the hillsides of the Santa Ynez appellation, this wine is full of cherry flavors and aromas with an interesting note of black tar. Oak is used, which makes it nice and smooth, but the bright acidity keeps it interesting. Perfectly drinkable now, or cellar it if you can wait. 1100 cases produced. Good QPR. 2004 Syrah Roasted Slope Vineyard ($34): This is a big, interesting wine made from Syrah and Viognier grapes that are interplanted in the same hillside vineyard (just like in the Cote Rotie in France). The grapes are picked and fermented together. Black cherry, plums, and a hint of strawberry in the aromas and the palate. Would benefit from 2-10 years in the cellar to help round out all its edges, but I have no doubt in time it will be spectacular. 800 cases produced. Good QPR. 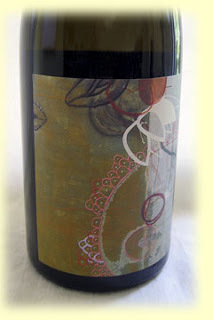 2004 Syrah Westerly Vineyard ($36): Made from grapes from the eastern part of the Santa Ynez AVA. This produces Syrah with higher alcohol and lower acidity due to ripeness and less marine influence. This monster wine had 15.4% alc./vol. and didn't even taste alcoholic. Flavors and aromas were typical of the varietal, with blackberry and spice notes. 284 cases produced. Good QPR. 2005 Viognier Late Harvest ($20/375 ml): A yummy dessert wine, with peach jam and honeysuckle aromas and flavors. On the back end you got a bit of apricot. Not as sweet as most late harvest viogniers, it would be excellent chilled and served on its own as a dessert, or with fruit-based desserts. Very good QPR. I was really impressed with all the wines I tasted, and for Rhone lovers Murray is a name to watch. Murray does have a wine club, and given how few cases are made of these wines it is appealing to think of receiving them on a regular, reliable basis. The prices are a bit steep for me, but I did leave with a bottle of the Chardonnay, the Esperance, and the Late Harvest Viognier because they were so darn good. 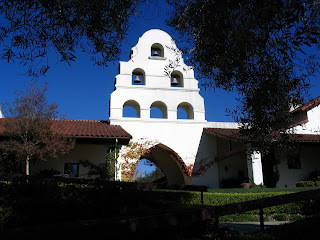 Bridlewood Winery was our first stop in Santa Barbara. Located in the Santa Ynez Valley AVA, Bridlewood specializes in Rhone varietals such as viognier, rousanne, marsanne, and syrah. Located on a beautiful spot, the winery used to be a horse farm, and still has horses roaming around in the back. When we arrived we headed into the tasting room, which had lots and lots of Bridlewood gear--t-shirts, tote bags, baseball hats, it went on and on--and some snack foods in case you wanted to buy a bottle and go out to the terrace for a picnic. We decided to go straight for the tasting, which was $7 for four pours (and the rolled-edge, Bridlewood etched glass was yours to keep). This tasting had the fewest pours, and the middle price of the three. Could it be all the merchandising that drives up the prices?? And do people really want all these glasses? I'd rather have a cheaper tasting and no glass! We began the tasting with the 2005 Bridlewood Winery Viognier Reserve Central Coast ($24). 10,000 cases of this wine were made, and I felt it was the best wine of the tasting. I did find bottles at significantly lower prices on Wine-Tracker. This was a slightly sweet, aromatic viognier with citrus and flower aromas and a peachy palate. It would be excellent with curries and rich fish dishes. Good QPR. The next wine poured was the 2004 Bridlewood Winery Arabesque ($24), Bridlewood's red Rhone-style blend made of Grenache, Mourvedre, Cinsault, Syrah, and Viognier. Light cherry in color, with spicy box aromas, there were cherry flavors and a bitter tobacco flavor on the palate. This wine just didn't hang together for me, and I wasn't at all sure that ageing the wine would help. Poor QPR, given the low prices of most Rhone blends from the Rhone. 970 cases produced. Next up: the 2005 Bridlewood Winery Syrah Reserve ($22) Predominantly (93%) syrah grapes, blended with a bit of grenache, Roussanne, and Cinsault. This was a big wine, with blackberry, plum, and spicy cedar aromas. In your mouth, you got a smooth, extracted taste of blackberry jam. Unlike the Arabesque, I felt this would continue to improve during a few years of cellaring. Good QPR. Finally, we had the 2003 Bridlewood Winery Syrah Blue Roan ($30). Faint blueberry and flowery aromas were accompanied by a definite whif of sweet, round oak. There were flavors of cassis and blueberry, with some soft tannins. Very round. Drinkable now, this wine should also improve steadily in the cellar for another 2-3 years. 554 cases produced. Good QPR. I didn't feel any of these wines were special enough to warrant the prices, but my dad found a bargain: bottles of the 2001 Reserve Syrah for just $9. I wished they had poured some of their gewurztraminer, or one of their late harvest viogniers or syrah ports to round out the tasting a bit. Still, we were glad that we went and tasted these small-production wines that we would not in all likelihood see in the stores.